Naturally, the first technology for producing kind of 3D models by mechanical means, which might be considered to be to some extent analogous to today’s 3D scanning and rapid prototyping (3D printing) technologies, was developed by a sculptor. 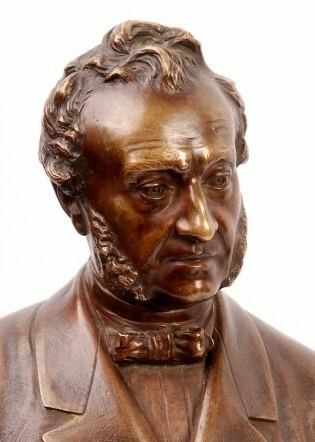 In 1859 the French François Willème, who characterized himself as a painter, sculptor and photographer, and inventeur de la photosculpture, developed a method for 3D modeling, called sculpture photographique (photographing sculpture), mechanical sculpture, or sculptural portraits, which used photographic and mechanical means for 3D modeling of the human body. In fact, there was another sculptor, Antoine Samuel Adam-Salomon (1818-1881), who before Willème was attracted to photography as a media for accurately depicting volumetric forms, but Adam-Salomon gave up sculpture for photography (and became the best French photographer of his time), while Willème envisioned the commercial and industrial applications of photography to the manufacture of sculpture. Willème presented his invention to the Société française de photographie on 17 May, 1861, but needed two more years to open a large studio at 42 Boulevard de l’Étoile off the Arc de Triomphe. Willème needed finances and formed a corporation for this purpose. Interestingly, one of the principal stockholders in the company was the banker Isaac Péreire, the grandson of Jacob-Rodrigues Pereire, the creator of Pereire calculating machine. The studio (see the lower image) had a modern cupola, forty feet wide and thirty feet high constructed of iron mullions with blue and white panes of glass. Willème's studio was attended by the good company of the Second French Empire, including the imperial couple and its entourage, personalities of the artistic and literary world, and society women. The vogue of photosculpture even exceeded the French borders: similar studios opened in London in 1864, and in New York in 1866. Willème was invited to Madrid to make portraits of the royal family of Spain, and was rewarded with the insignia of the order of Charles III of Spain. In his studio, according to the words of the journalist Henri de Parviel, A sculptor and the sun will become collaborators working together to fashion in 48 hours busts or statues of a hitherto unknown fidelity of such great boldness in outline and admirable likeness. Although in 1867 the photosculpture of Willème was presented successfully at Exposition universelle d'art et d'industrie in Paris, at that time the passion for photosculpture had already reached its end, and the business declined, so in 1868 Willème left his workshop (although it continued to work for some more years without its founder) and returned to his hometown of Sedan. What is the process of photosculpture? It was the reproduction of persons or objects in 3-dimensions with only a minimal requirement for handwork, by taking a series of photos in the round and using them as synchronized photo projections to create a sculpture. To create a photosculpture Willème would arrange the subject on a circular platform in his rotunda laboratory, surrounded by 24 cameras (one every 15 degrees). He would then photograph his silhouette simultaneously with each camera. This set of photographic profiles contained the data for a complete representation of his subject in 3 dimensions. Willème had now collected layer data for his subjects in the form of 24 different photographs of their profile. To create a 3D image of the subject he needed to make the information in each layer accessible by projecting each image onto a screen. Next, he translated each image into the movements required to fabricate each layer. This he accomplished using a pantograph (seen at the right side of the upper image) attached to a cutter. Willème traced each profile with one end of the pantograph while the other end cut a sheet of wood with the exact same movement. The pantograph allowed the cuts to be smaller, larger, or the same size as the original projection. The layers of wood were then assembled to create the photosculpture rough armature which he would fill in with clay (or other suitable material) and then perhaps cast or paint it, to make it look like a traditional sculpture. The client had a choice of the size of his photosculpture, and he could get a statuette measuring some 50 cm, a medallion with smaller size, or a bust of full or half-size. He had a choice of the material as well—plaster of Paris, terra-cotta, biscuit, bronze, alabaster, and even metal-plated by galvanoplasty. The price of a photosculpture, depending of the size and materials used, was from 270 to 500 Francs, and the time needed for manufacturing was 2-4 days (a conventional sculptor would need 3-4 months and some 3000 Francs for a life-sized bust). As the hand-cutting stage of Willème’s photosculpture could still considered to be a labor-intensive process, an interesting attempt to eliminate this stage from the reproduction process was made in the beginning of 20th century by the Italian engineer from Florence Carlo Baese di Castelvecchio (1877-1943, a grandson of Louis Bonaparte, the brother of Napoleon Bonaparte). He proposed and patented (US patent 774549) a technique for reproducing physical objects, which employs a photo-sensitive gelatin which expands in proportion to its exposure to light. In Baese’s technique, the object to be reproduced is photographed whilst being illuminated with graduated light, so as to achieve maximum depth of contrast. Then photographic plates are produced, through which light is exposed onto photo-sensitive gelatin. When treated with water, the photosensitive gelatin material expands to form a relief corresponding to the three-dimensional shape of the bust. Who was the inventor François Willème? 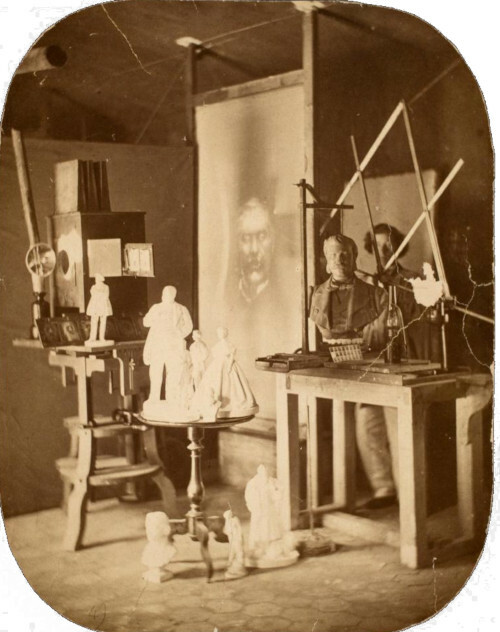 Strangely, little is known about his life, we don't even have a picture of him or his family, which is quite unusual for an artist and photographer (nearby you can see his only auto-portrait, made around 1865, using the photosculpture technology). Auguste François Willème was born in Sedan, Ardennes, оn 27 May, 1830. He was the son of a liquor retailer. As a boy, Willème took drawing lessons at a local school. In the middle 1840's Willème and his family moved to Paris, where he enrolled at l’École des beaux-arts de Paris, to study painting under Henri Félix Emmanuel Philippoteaux (1815-1884), specialist in history and portrait paintings. Willème also studied sculpture, making models for manufacturers of art bronzes, and in early 1850s he was attracted to photography, firstly to documents his statuettes. After developing of photosculpture in 1859-1860, Willème found a company, attracted investors, and in April 1863 opened a large studio in Paris. However, despite of the initial success and glory, he was forced to left his studio in 1868 due to financial difficulties and returned to his hometown of Sedan. There he entered into a partnership with a local photographer, and gave drawing classes at Collège Turenne. In Sedan he also continued to make photo-sculptures. Sometime after 1885, Willème and his wife retired to Roubaix, near Lille. Auguste François Willème died in Roubaix on 29 January 1905.